1 Day Acuvue TruEye lenses are equipped with HYDRACLEAR moisturising technology, UV filters, and inside-out indicators. Try one of our best-sellers today! 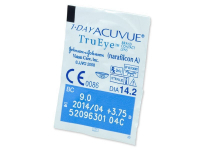 1 Day Acuvue TruEye are produced by Johnson and Johnson and are the world’s first silicone hydrogel daily disposable lenses. The lenses are equipped with the HYDRACLEAR® moisturising technology, UV filters, and inside-out indicators for easier handling. They are made from a narafilcon material that provides high oxygen permeability, thus ensuring an excellent transmission of oxygen to the cornea. This package contains 30 lenses. We also offer larger packages of 90 lenses and 180 lenses at superior prices. With HYDRACLEAR® technology, a wetting agent is added directly to the lens material during production, embedding it throughout the lens, rather than adding it after they are made. The lens surface remains smooth and soft, and the eyes stay naturally moist and comfortable all day. 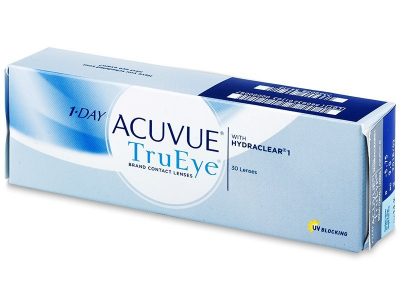 1 Day Acuvue TruEye contact lenses feature UV filters, which provide the wearer partial UVA and UVB protection. The inside-out mark makes it easier to determine the correct position for inserting the lens into the eye. 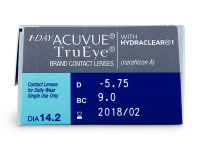 Note: The manufacturer approves of the transition from previous versions of ACUVUE daily lenses (1 Day Acuvue and 1 Day Acuvue Moist) to 1 Day Acuvue TruEye, if the wearer's pres­cription has not changed. However, when switching to this brand from an entirely different brand, please consult an ophthalmologist beforehand. Never buy a brand of lenses that wasn't prescribed to you by an eye care specialist. Comfortable lenses and buying them online is perfect. Really convenient to get them delivered when I want. I think Dailies Total 1 is better if not a bit more expensive. 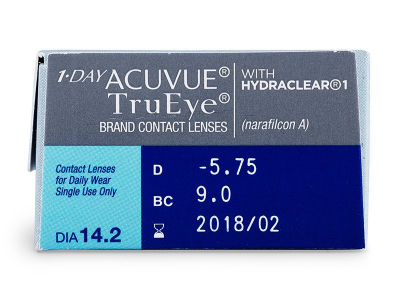 is there such thing as 1 day acuvue trueye astigmatism lenses? needing dailies for astig. thx. Hello there, do you supply Acuvue Trueye astigmatism lenses? 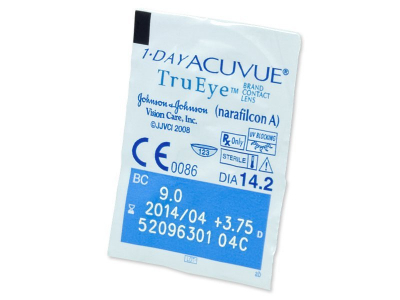 I am wondering about the 1 day acuvue trueye material. Is it as good as the acuvue moist? I am considering changing to these lenses, but worry about my dry eyes. Hello Clarice, both materials provide excellent moisture and comfort. 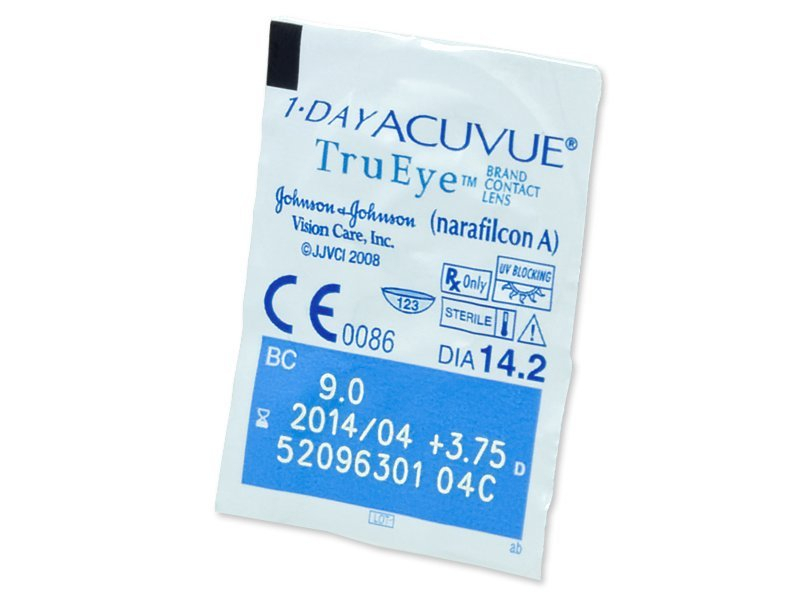 The Acuvue TruEye lens material is called Narafilcon A, and it allows exceptionally high oxygen permeability. Excellent price. Was a bit unsure at first, but very glad I've discovered your site. Authentic and easy to order. Best price i've found online. Delivery took a little longer than expected, but well worth the wait for this price and service received. Many thanks. My optician recommended me Acuvue Trueye contact lenses since she found out that I suffer with dry eyes. I have never tested any other contact lenses but these are really good. Why does it take so long to deliver. Are you in Eastern Europe? Thank you for your recent comment. Our main offices are based in Central Europe (Czech Republic) this can take 2–5 days to reach you from dispatch on our standard delivery, we do however also offer an express delivery (DHL) which guarantees the items to be with you within 1–2 working days. Had problems wearing lenses all my life, the Acuvue Moist were pretty good but the TrueEye are perfect. I keep forgetting to take them out at night as I forget I am wearing lenses at all. Please make a TruEye lens for astigmatism soon!